In the new movie "Harry Potter and the Chamber of Secrets" the boy wizard returns with his best friends, Ron Weasley and Hermione Granger, for the second year at the Hogwarts school. 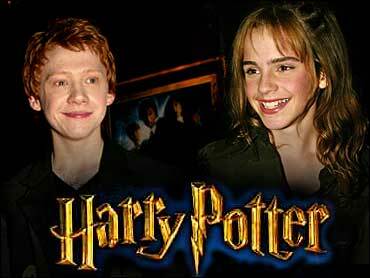 Reprising their roles from "Harry Potter and the Sorcerer's Stone," Rupert Grint plays Ron and Emma Watson plays Herminoe. Both joined The Early Show to discuss the film. Watson and Grint had never acted professionally before being cast in the first "Harry Potter" movie. But it is the chemistry of the two, along with the acting of Harry Potter himself (Daniel Radcliffe), that critics say help make the first Potter movie good and the second better. The 12-year-old Watson performed in several school productions before taking on the Hermione character. Her character is obsessed with books and schoolwork, but is fiercely loyal to her friends. Rupert Grint again plays the youngest Weasley brother and best friend to Harry Potter. He brings to the sequel a British Critic's Circle nomination for Best Newcomer for his work in the original. Since filming the first Harry Potter film, the 13-year-old has gone onto to star with Simon Callow and Stephen Fry as a young madcap professor in Peter Howitt's "Thunderpants."